There’s a strange satisfaction in being consistent with my fabric choices… so I was pleased to realised that both these recent makes feature feather-ish shapes with black, white and jewel-tone colours! There’s really no other similarity in the projects, but I’m blogging them both together anyway. First, a 2nd-hand dress refashioned into a tank. The dress had sat unworn for a couple of years ( I think Another Sewing Scientist has the same dress, and the same fit issues with it!) The tank is mostly made from the skirt, with the bands cut from the bodice and sleeves. The skirt wasn’t *quite* long enough to make the tank, so I had to bodge things a bit, including the contrast black on the front shoulders. With such a busy print though, you can’t even see that the old waistband actually runs between my shoulder blades, or that the bands include old seams… a good print distracts from many faults, ammiright? Hello, white arms and Frank the cat! Needless to say, I’ll be wearing this under a cardigan for a good many months yet. 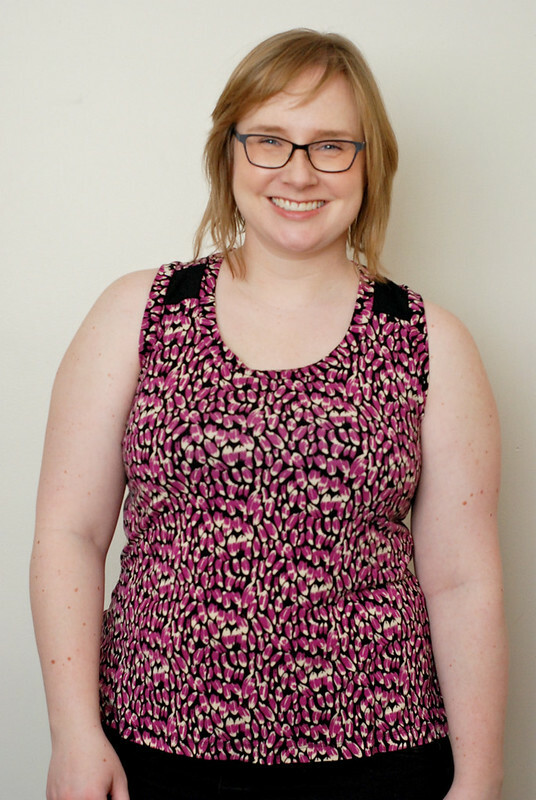 The pattern is Jamie Christina’s Mission Maxi – one of my most-used patterns! I tend to widen the back and straps to make it more bra-friendly. Jalie has a really similar pattern which is included with my favourite raglan shirt, so if you are looking for something similar, I’d recommend that! The second shirt is a Grainline Hemlock. I’d tried to make it once before in a stiff stripe jersey, and IT. WAS. HIDEOUS. (I looked like a fat, frumpy hunchback. It was refashioned immediately.) The pattern has been calling to me this spring though, so I thought I’d give it another chance in a drapey fabric! I got this at Fabricland last weekend for $4/m, so I didn’t have much to lose. 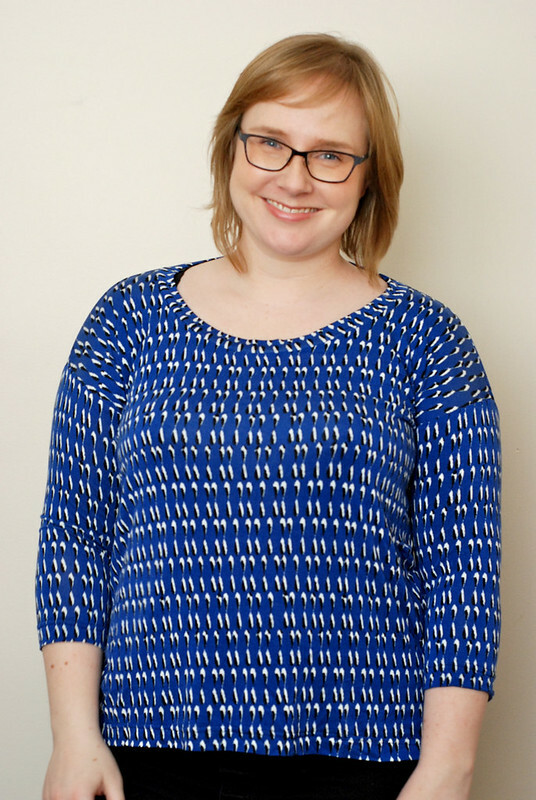 Hemlock is a free pattern and drafted for just one size, meant to have heaps of ease on someone slim like Jen from Grainline. I knew I didn’t want that much ease, so I just added 4″ total even though I’m much bigger. Turns out that was too much, so I cut up my finished shirt and basically got rid of that extra ease so that the shirt in the photographs is basically the pattern as drafted, with a split high-low hem for fun, and the neck scooped lower. I like the finished shirt, but I’m not sure the dropped-shoulder look is for me. I’ve got very rounded shoulders from slouching, and pudgy arms, so the dropped seam hits at my widest point. (It’s a great pattern though! Well-drafted and quick to sew.) I never regret experimenting with different shapes though – you never know when you’ll stumble on a style that will become a new favourite! Have you got any new styles/trends you’d like to try out this spring? What’s my pledge for Me-Made May 2015? These are both cute! I love the prints. 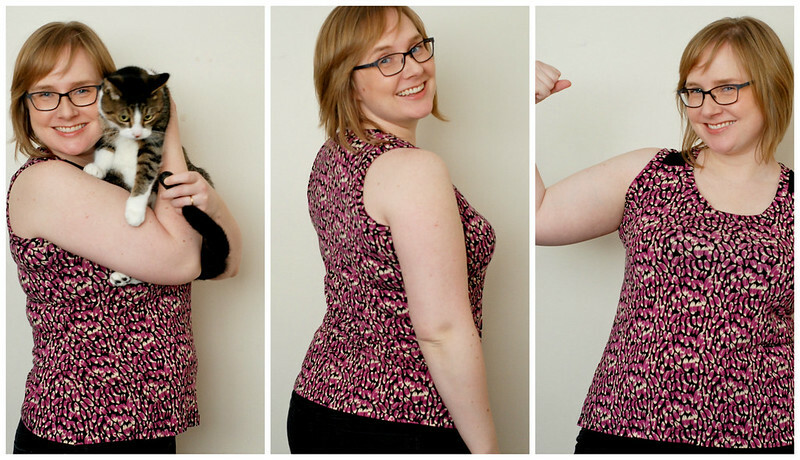 If you like this silhouette, you may want to try the top from Simplicity 1366. It has a dropped shoulder, but not as dropped as the Hemlock. It is designed for a woven, but I think it could work great for knits as well! Thanks for the pattern suggestion, Lisa! The skirt that goes with it reminds me a lot of the Megan Neilson Cascade skirt – if only I ever had somewhere appropriate for such a dramatic look, it would be fun to make too! Oh yes, that skirt looks so fun!! I’d love to make it, even though I’d probably never wear it! A couple of very lovely tops there. Great job. Thank you! Something about the change of season always makes me twitchy for new basics! I am totally amazed at your refashioning! That first top looks great! I would have never guessed that it used to be a dress. Awesome! The Hemlock looks fantastic too! And I love the fun high-low hem. I have the same issues with the dropped sleeve, I’m just not sure it’s flattering on me. I’ve only ever made one Hemlock, but I’ve been wanting to try it again – you’re inspiring me! I’m also considering the Mandy Boatneck Tee from Tessuti. It’s a similar style but a little bit different neckline, and it’s free too! I just did a tee with a super dropped shoulder and I’m on the fence, too. I think I like a dropped shoulder only when it’s just slightly dropped, if that makes sense. Love both fabrics!! I like both shirts – very springy. Thank you! The truth is that my spring and winter wardrobes are basically the same ” tank top with cardigan” or “3/4-sleeved shirt” – but the colours change, and therefore I feel like clothes are “spring” or “winter”! These are both so pretty, as is Frank. He’s a twin of my Sox! Sox always used to be very aloof but now in his old age he’s super affectionate. Frank looks quite young, is he? Nothing wrong with finding some similarity between your prints–it just means you understand your taste well! Hooray for feathery looking prints! I think the Hemlock looks pretty cute on you, but understand your feelings about the dropped shoulder. I’m not convinced about drop-shoulders on me either, but I think your Hemlock looks good. 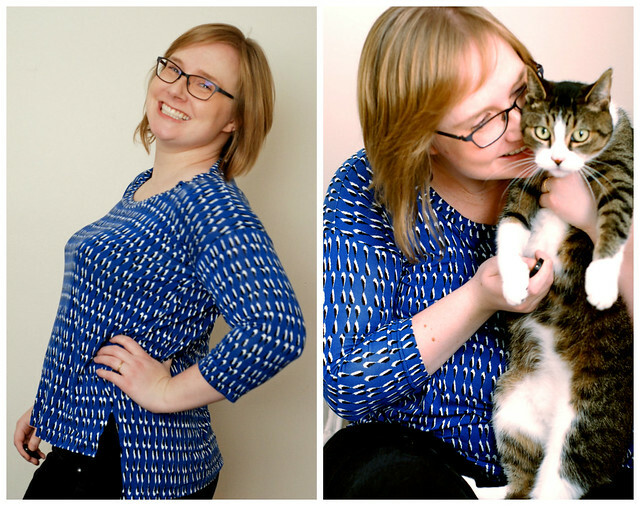 The prints of both shirts are lovely – the blue in particular looks great on you! Love both of these, especially the black contrast bands. 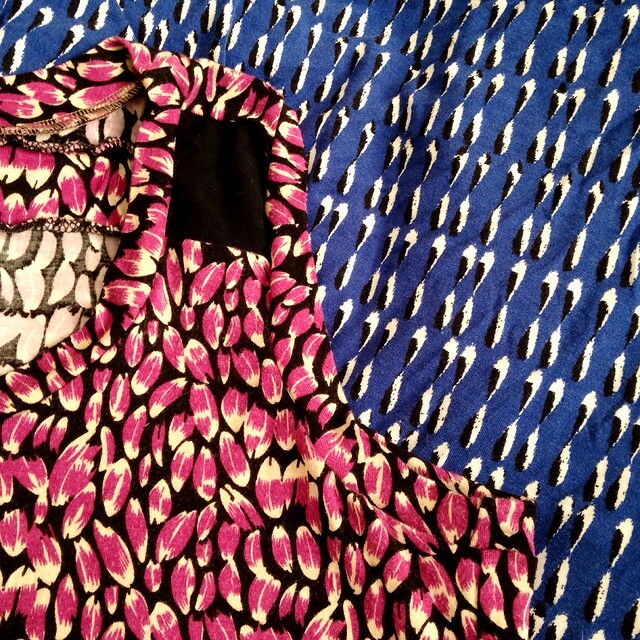 Wow–both of these prints have such fun visual texture. I’m desperately clawing my way towards even examining trends, but I have to recover the couch in my sewing room first…it’s been an eyesore I can no longer ignore! But your couch is looking SO GOOD!!!!!! Do you think you’ll get it done this week? You always look so good in blue! It makes your eyes pop! Nice save on the first top. It’s super cute and so is Frank of course!! I had the same faux-wrap dress given to me as a present, and the bodice fit was weird. I cut off the bottom and made a skirt (creative, I know), and the bodice is still in my recycling bin. There is enough there to make a small top or undies, if all else fails. Hoping to crack open that coverstitch this weekend….